Prominent & Leading Manufacturer from New Delhi, we offer pulley lagging and ceragrip ceramic lagging. Abrasion Loss mm3 90 Max to 200 Max. FORECH-HILTON offers a comprehensive range of Patterned Sheet Pulley Leggings to suit every conceivable conveyor installation. The Pulley Laggings offered by FORECH- HILTON are produced in different thicknesses, rubber qualities and patterns to ensure selection of the most appropriate type, to suit all application requirements.The Sheet Pulley Laggings offered by FORECH-HILTON come with CN Bonding Layers for better adhesion levels as also with a buffed surface. The profiled patterns on the top surface, in diamond or square embossing, improve belt grip and tracking on conveyors, while reducing belt wear. The Sheet Pulley Lagging is available in various grades of rubber, including FRAS and oil resistant grades. 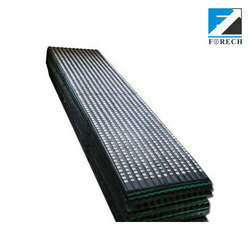 FORECH-HILTON Diamond Profile and Plain Pattern Pulley Lagging Strips have been specially developed for covering of conveyor pulleys. These easy to use Lagging Strips can be fitted to the Pulleys with the help of cold bonding adhesives in the workshop or at the conveyor site itself, providing extraordinary saving in terms of expenses incurred on account of downtime and usage of an autoclave. It has been proven that similar adhesion levels can now be achieved with cold bond adhesives as with vulcanization.FORECH-HILTON Strip Lagging is available in a variety of designs, to suit the various application requirements. These are manufactured with 60 to 65 Durometer rubber compound, having an excellent abrasion resistance. All the designs offered by FORECH-HILTON have excellent water shedding characteristics. Supplied in Roll sizes ranging from 10 to 85 meters in a width of 205 mm, they can be custom fitted to any pulley size with minimal wastage. 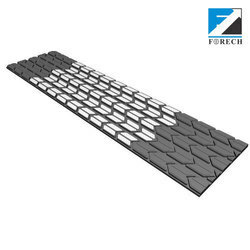 Forech ceramic pulley lagging provides the best grip for your drive pulley. The ceramic inserts in the lagging surface provide both high friction and high wear resistance-providing the best protection for your pulley and belt in the most demanding conditions. Ceramic pulley lagging is ideally suited for wet and muddy conditions where belt slippage can be a major problem. The high coefficient of friction of the ceramic tile inserts with the belt also allows for belt tension to be reduced. This also improves the life of the belt, as well as that of the other belt components as they come under less stress. The surface of the lagging is profiled similarly to that of profiled rubber pulley lagging. This allows for effective drainage. The maximum tension T1, generated in any conveyor belt is the tension which is required to be imparted on the belt in order to transmit, through traction, at the belt-pulley interface, the tension, Te, necessary to overcome all the system resistances and convey the desired throughput at stipulated operating parameters in the diagram. The residual tension T2 is responsible for maintaining the integrity of the belt run and limits the inter-idler sag of the belt to permissible limits. The three tension values are related through mathematical equations, namely. The value of µ is determined using the dynamic test rig as shown below. A section of the belt is wrapped around a pulley (180 degrees Arc of Contact) with a constant load on one end. A motor applies a torque force to the pulley. At a threshold torque, the pulley begins to rotate. From the second relationship in the diagram (T1/T2 = eµØ ), we see that the tension on the belt (T1) increases significantly as a coefficient of friction (µ) increase. Reduced slip and therefore less wear on the belt and lagging. The frictional force is significantly increased in the ceramic lagging due to the mechanics of the dimples. However, care has been taken that this does not damage the conveyor belt.